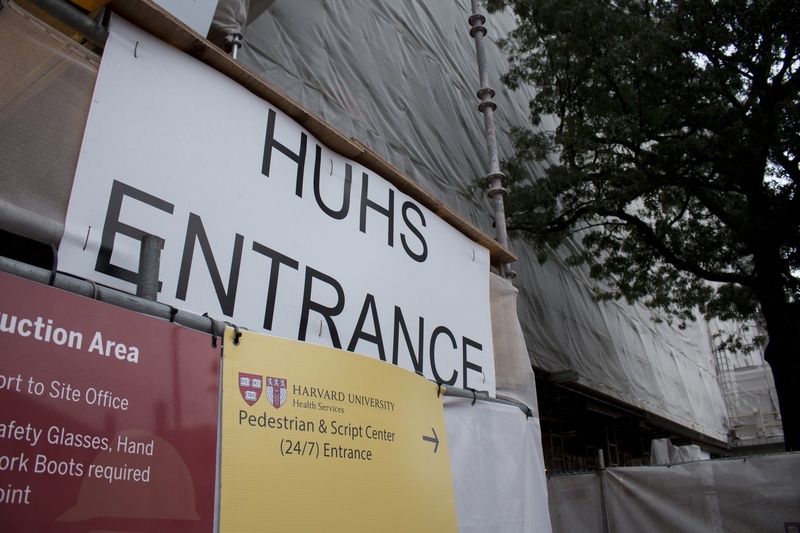 Because the Smith Campus Center continues to be under renovation, the temporary entrance to HUHS is marked with a sign. Barreira recommended that students take several precautions ahead of the Harvard-Yale football game, slated to be played on Nov. 17. He advised students to wash their hands often with soap and water, refrain from sharing smoking materials and glasses, and avoid touching their eyes, noses, and mouths. Barreira also gave a few guidelines for students who plan to host parties, recommending that they offer paper cups for drinks, limit crowds, and encourage guests who are ill to leave and contact HUHS. “Prevention of mumps and mono is centered on good hygiene and reducing the spread by saliva,” Barreira wrote in the email. People infected with mumps may experience a host of symptoms including facial swelling, jaw pain, ear ache, and testicular swelling. Though the vaccine given to mumps patients is 88 percent effective, mumps outbreaks can still occur among “highly-vaccinated” individuals, particularly when they come into close contact with one another, according to the Centers for Disease Control and Prevention. Even with good hygiene and preventive practices, mumps has the potential to spread through the air as well as through human-to-human contact, per the World Health Organization. In 2016, Barreira said 99 percent of undergraduates had been vaccinated against the disease, citing mandatory student vaccine documentation. By contrast, mono is a relatively common illness on college campuses. The disease can cause fever, sore throat, swollen glands, and fatigue. Barreira concluded his email by urging students to refrain from public activities and to contact HUHS if they begin to experience the symptoms of mumps or mono. “We all have a responsibility to help prevent the spread of these viruses,” Barreria wrote.